24. United States, present locations are: Southern California, New Mexico and the Northeast. Past locations include Oregon, Northern California and Arizona. People are free to attend modules all over the world – an exciting, cross-cultural experience that leaves a deep impression. Seekers from at least fifty countries have participated in GTT modules worldwide. Often a participant will attend modules on two or three continents. It's global quality is one of our favorite aspects of the program, and many people share that feeling. Dave Misso, Donna Misso and Holly Harman, module staff; and group room. Spain, which began as a regional training, has become the vital central location for the entire European community. The Spanish training now includes many English-speaking trainees from the US, Russia, Ukraine, and other Eastern European countries. In addition to the locations where modules take place, there are currently three countries where participants can choose to attend their requisite ‘closing certification intensive’: US, Spain or Russia. There is also a customized certification intensive taking place in Kerala, Southern India, this December; our first certification intensive on this continent. Marianne Murray, Father Johnson and Holly Harman; group room. Because currencies and incomes vary across the world, some of these trainings are offered pro bono. In others, costs for organizers and participants are matched to the situation of their country or region (e.g. either at reduced fees or on a sliding scale). In the U.S. and in most other locations, work/study programs reduce fees in exchange for helping at the modules. In order to make the training more accessible to those with financial concerns, flexible payment plans are available. In addition to the certification program there, another vital upgrade in the world-training format also had its beginnings in Spain. At this point, we have, over the past decade, provided essentially a double, or two-tiered program at all training locations in the world. The first, of course, is for those who wish to be certified as practitioners. And the second is a rigorous, hands-on opportunity for certified practitioners to apprentice and facilitate, being supported by and learning from the skillful facilitation modeled by more experienced training practitioners and staff. Besides elevating the quality and expertise of the traditional training, this untitled, de-facto program within the existing training format ensures the development, continuation, and expansion of a worldwide base of quality facilitators ready to step in and lead modules on their own over the coming years of the expansion of the world-wide training effort. The result of this has been the protection and nurturing of the incontestable, core principles that make the Holotropic perspective such a unique, vital modality. We'd also like to mention the many other skillful and dedicated certified practitioners who have served on staff; some once, some occasionally, and a few at dozens of modules. 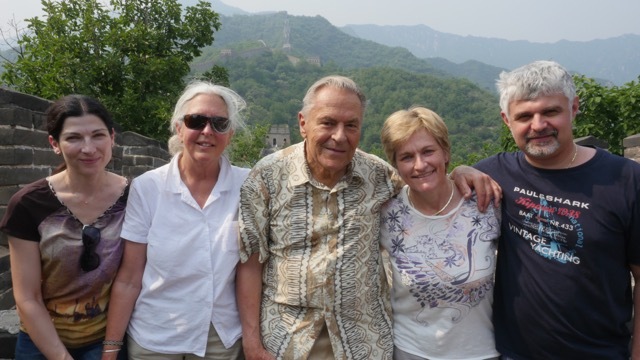 Stanislav Grof, M.D., Ph.D., is the originator (with Christina Grof) of Holotropic Breathwork, creator of Grof Transpersonal Training, and its owner until 1998. At 84 years of age, Stan is still the most vital and energetic person we know, and he remains active in the training - primarily teaching theory in two-day stretches at modules all over the world. 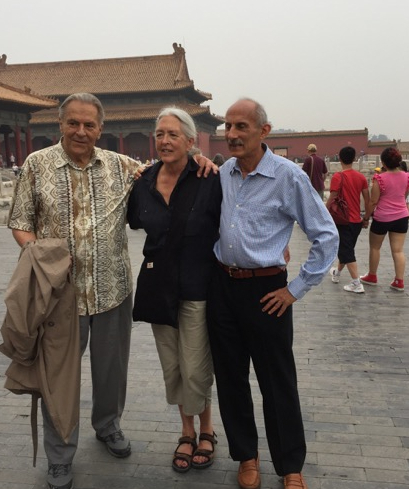 Stan Grof, Diane Haug and Jack Kornfield; Alexandra Emelianenko, Diane, Stan, Holly, and Vladimir Emelianenko. China, June 2015. As you most likely know, Christina passed on the night of June 14 to 15, 2014. She is deeply missed. Her contribution to this work cannot be overstated. Holotropic Breathwork is truly a creation of both Christina and Stan and their relationship; everything that we now get to experience with Holotropic Breathwork is thanks to how, together, they brought it to the world. Since she is no longer limited by time and space, we now enjoy imagining Christina’s elegant, supportive and fun-loving presence at all the training modules. We are currently formulating a vision for the next stage of Grof Transpersonal Training. GTT has recently asked for detailed feedback from a group of over 25 people who have been a vital part of the training all over the world. A working group of six will the take these responses and use them to craft a five-to-ten year plan, which will be shared with the Holotropic community. We are also re-designing and updating the website for GTT. These are only two of several projects we are working on. We will provide you with updates on these as they become available or reach fruition. We believe that Holotropic Breathwork is one of the most effective and valuable methods for doing deep inner work. We are devoted to seeing this practice reach anyone who is interested and would benefit from it. For over two decades we have been dedicated to providing quality training that adheres to Stan and Christina’s original work. We have allowed this practice to grow and spread at an organic, realistic pace - while maintaining the key elements that distinguish it from other forms of breathwork. We know that many, many of you feel the same passion about this work. We honor the variety of ways in which you have participated and practiced: as students, teachers, facilitators, researchers, artists, attendees of the dying, doulas and midwives for those being born, sitters for inner journeys of all varieties, parents, business persons, and bringers of the holotropic perspective to all that you do. We will continue to do our best to remain true to this work and to your interests in it. It is a sacred gift and we take it very seriously. Based on a broad understanding of the human psyche that includes the biographical, perinatal, and transpersonal dimensions. Phenomena from all these domains are seen as natural and normal constituents of the psychological process; they are accepted, and supported without preference. Recognition of the fact that non-ordinary states of consciousness induced by Holotropic Breathwork as well as similar states occurring spontaneously, mobilize intrinsic healing forces in the psyche and the body. As the process is unfolding, this “inner healer” manifests therapeutic wisdom which transcends the knowledge that can be derived from the cognitive understanding of an individual practitioner or from any specific school of psychotherapy or body work. The basic elements in Holotropic Breathwork are deeper and accelerated breathing, evocative music, and facilitation of energy release through a specific form of bodywork. This is complemented by creative expression, such as “mandala” drawing, and discussion of the experience. Holotropic Breathwork can be conducted on a one to one basis, or preferable in a group situation, where participants alternate in the role of experiencers and “Sitters”. 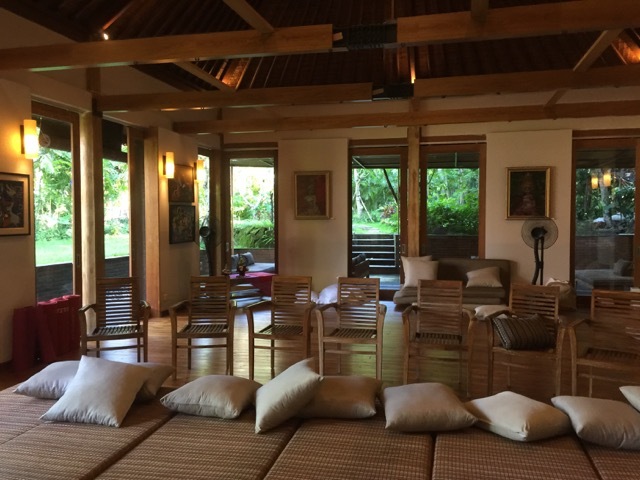 Before the first breathing experience, participants receive an in-depth theoretical preparation that includes a description of the major types of phenomena that occur in Holotropic sessions (biographical, perinatal and transpersonal) and technical instructions for both experiencers and Sitters. Physical and emotional contraindications are discussed and if there are any concerns, expert assessment is obtained. Holotropic Breathing is faster and deeper than usual; generally no other specific instructions are given before or during the session as to the rate, pattern, and nature of breathing. The experience is entirely internal and largely nonverbal, without interventions. Exceptions are constriction in the throat, management problems, excessive pain or fear threatening the continuation of the session, and explicit request of the Breather. Music (or other forms of acoustic stimulation -- drumming, nature sounds, etc.) is an integral part of the Holotropic process. Typically, the choice of music follows a characteristic pattern that reflects the most common unfolding of the Holotropic experiences: at the beginning, it is evocative and stimulating, later it becomes increasingly dramatic and dynamic, and finally it reaches a breakthrough quality. Following the culmination, it is appropriate to shift gradually to quieter music and end with peaceful, flowing, and meditative selections. Although this seems to represent the statistical average, is should be modified if the energy in the group suggests that a different pattern is indicated. The role of the Sitter during the session is to be responsive and non-intrusive, ensure effective breathing, create a safe environment, respect the natural unfolding of the experience, and provide assistance in all situations that require it (physical support, help during bathroom breaks, bringing tissues or a glass of water, etc.) It is important to remain focused and centered while facing the entire spectrum of possible emotions and behaviors of the Breather. Holotropic Breathwork does not use any interventions that come from the intellectual analysis or are based on a priori theoretical constructs. It is important to leave sufficient time for the sessions, usually between two and three hours. However, as a general rule, the process is allowed to reach a natural closure; in exceptional cases, this can take a few hours. In the termination period the facilitator offers bodywork (energy release work), if the breathing has not resolved all the emotional and physical tensions activated during the sessions. The basic principle of this work is to take the clues from the experiencer and create a situation where the existing symptoms are amplified while the energy and awareness is held in this area, the subject is encouraged to express fully his or her reaction, whichever form it takes. This form of bodywork energy release work is an essential part of the Holotropic approach and plays an important role in the completion and integration of the experience. Facilitators of Holotropic Breathwork should recognize that, when they utilize a technique which evokes a non-ordinary state in a client, there is a potential for unusually intense projections, including regressed longings for nurturing, sexual contact, or spiritual connection. These projections are often focused on the facilitator. In such cases the facilitator should be sensitive to the imbalance of power in the facilitator and client roles and take care to assist clients with such feelings as they arise. Facilitators make agreements to conduct their practice of Holotropic Breathwork in a ethical manner. Discussion groups take place on the same day after an extended break. During these sessions, the facilitator does not give interpretations of the material, based on a specific theoretical system, including that of Holotropic Breathwork. It is preferable to ask the experiencer for further elaboration and clarification reflecting his or her insights from the session. Jungian amplification in the form of mythological and anthropological references can be very useful in the discussion of the Holotropic experiences as well as the mandalas. On occasion, references to the facilitator's own experiences in the past or experiences of other people might be appropriate. There are many approaches that complement Holotropic Breathwork. However, whenever these are used, it should be clearly indicated that these are not a part of Holotropic Breathwork. If the practice of conducting the sessions itself departs significantly from the above descriptions, the name Holotropic Breathwork should not be used for such a procedure. We ask that it be replaced by a different term and not be associated with our names. 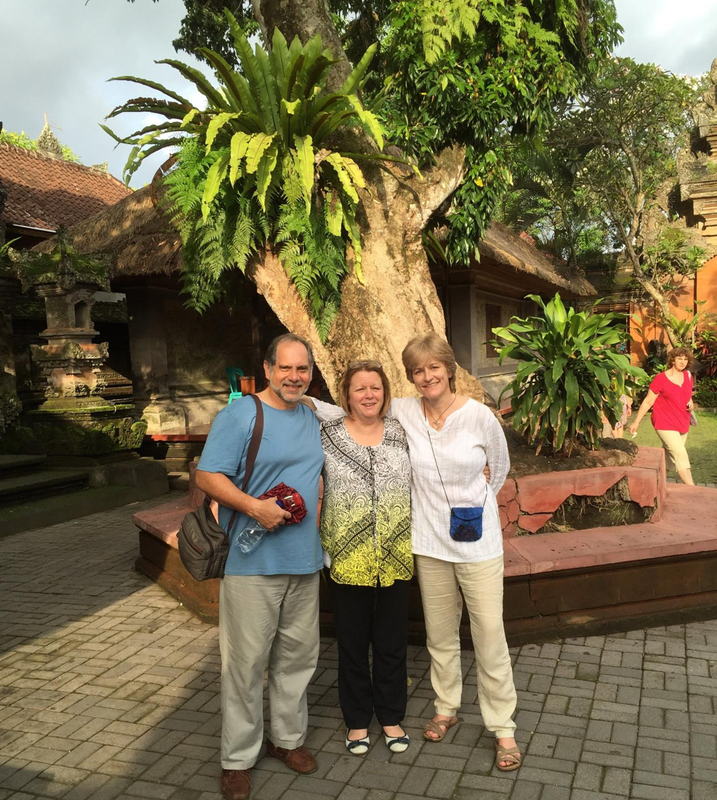 This is the completion of a three-year training led by Holly Harman and Marianne Murray, who are part of the staff of Grof Transpersonal Training (GTT). They have created a customized training to meet the participants’ experience and needs, while also holding the integrity of the GTT international training requirements. This training is essentially a labor of love. Holly and Marianne give their time and expertise pro bono and GTT has waived all training fees in support of this project. For the past three years, the India group has covered just the cost of travel and some training materials. Even this expense, though, is proving unsustainable for the organizers in Kerala. Those of you who have spent time in India know that the discrepancy between what is financially viable in the U.S. and Europe, and what is possible in India, is extreme. Your financial gift will help the Holotropic India vision to continue. 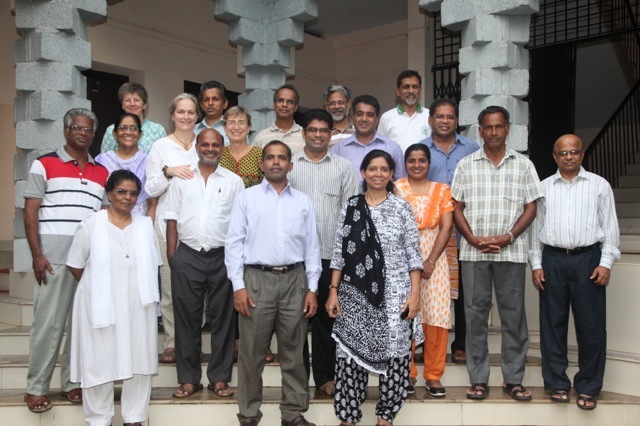 What began as a single round of certification training has taken root in a big way: a second training group is already forming; modules are planned for Bangalore and Chennai in 2016; and 40 post-grad counseling psychology students from Montfort College in Bangalore will be attending an introductory workshop in May next year. Additional workshops are in planning for Mumbai, Trivandrum and Sri Lanka. The small initial group of ‘founding’ trainees, is now the core of a burgeoning movement to integrate. 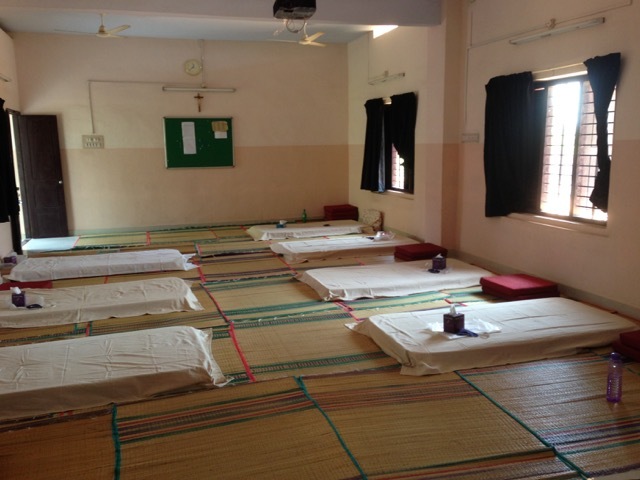 Holotropic Breathwork into a number of religious and secular educational programs nationwide (psychology, psychotherapy, social services, and theological studies) beginning with the Don Bosco Institute of Psychology and Spirituality in Trivandrum, which hosts the training. of what they are putting into motion. This project embodies beautifully the potential for big social change that Holotropic Breathwork promises ~ and that HB founder Stan Grof talks about with such passion. For this reason, it has been identified it as the inaugural funding campaign for the new not-for-profit Institute for Holotropics (IFH). Group room. Kerala, India, April 2015. 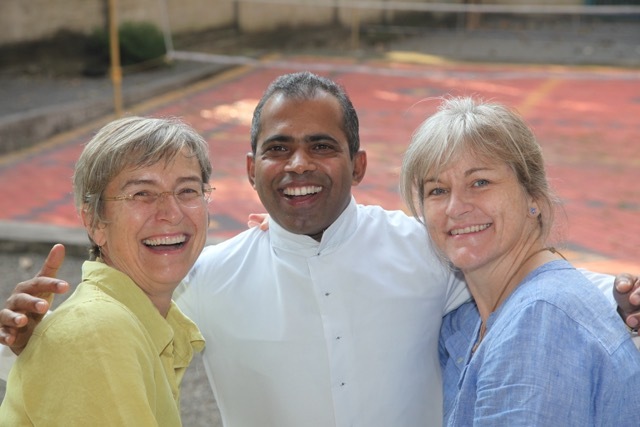 The priests are involved in the work of Don Bosco or associated projects and organizations run by Salesians. The focus of the Don Bosco order is the care and education of poor and disadvantaged children and this international order is now one of the largest educational NGOs in the world, working extensively with street children. The nuns are affiliated with a variety of orders, but their common focus is the care, education, and healing of girls, women and families who have been impacted by violence, trauma and poverty. Not all participants in the intensives during the past three years have been religious, but all have some association with Don Bosco, its training and/or its work.